Plans to transform a disused golf course at Flaxby into a sustainable new community with nearly 3,000 new homes, supported by improved transport links including a new rail station are will be submitted to Harrogate Borough Council next week. The planning application by Flaxby Park Ltd follows more than a year of discussions with Harrogate Borough Council to create a scheme that would be a template for sustainable development, with all the facilities to support a new community, from schools and GP surgery to open space. 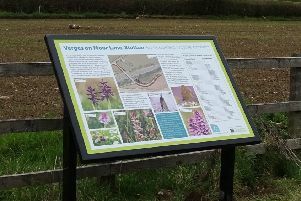 The development outside Knaresborough aims to make the most of its parkland setting retaining tranquil wildlife habitats created by the former Flaxby Golf Course, creating a sense of space. With easy access to junction 47 of the A1(M) this 430-acre site near Knaresborough is a prime strategic development site. It was acquired in 2016 by Flaxby Park Ltd which is owned by internationally renowned businesswoman and philanthropist Ann Gloag OBE and regeneration experts Chris Musgrave and Trevor Cartner. With ambitious plans for up to 3,000 jobs at neighbouring Flaxby Green Park - the £85m new technology-focused science park, which was granted planning consent in September, points to exciting times for Harrogate’s future growth, say the developers. Once the plans for Flaxby Park are submitted a period of statutory consultation managed by Harrogate Borough Council will begin giving residents and a range of organisations a further chance to have their say. The new scheme has been designed by a team of leading consultants, including local, respected architects, Wildblood Macdonald, which have been involved in prestigious regeneration projects in Yorkshire and further afield, including Whixley Gate in nearby Whixley, Melton Park near Hull and Froghall in Staffordshire.